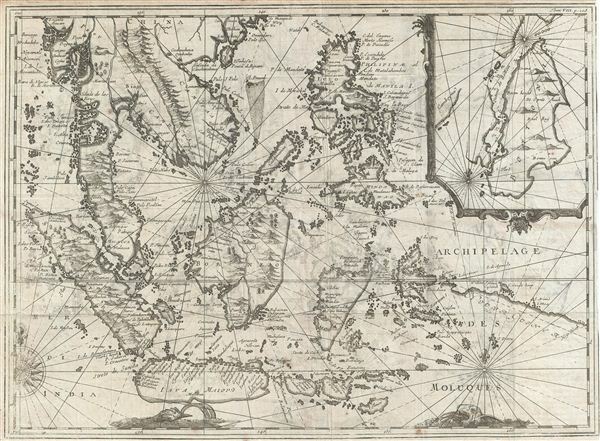 An extremely scarce and obscure c. 1619 map of the east Indies by Willem Cornelisz Schouten and Willem Janszoon Blaeu. Centered on Borneo, the map coves all of Southeast Asia and the east Indies from Pegu and Arakan in the North to Java and Timor in the South and from the Andaman Islands in the west to the Philippines and New Guinea in the east. This includes the modern day nations of Thailand, Burma (Myanmar), Malaysia, Cambodia, Vietnam, Laos, Indonesia, Borneo, and the Philippines. An inset in the upper right detail Buton Island or, as it is written here, Botton Island. As the map has no clear title and is very rare, with no other known example archived in any collection public and private, researching it has proven challanging. Cartographically this map corresponds point-for-point with the east Indies section of Willem Blaeu's 1609 wall map of Asia. The map's various decorative elements and its engraving style are also highly indicative of the Blaeu firm. If this is in fact a Blaeu map, it was not published in any of his major atlases and is most likely the earliest example of a Blaeu map to specifically focus on the east India Islands. The single most identifying factor on this map is the inset in the upper left quadrant of the Button Strait (Buton Strait). Booton or Buton Island is a small island set in the Flores Sea just the southeast of the Celebes or Sulawesi. The inset map details a strait, the Strait of Buton, separating the island form the nearby Pulau Muna or Moena eiland (here labeled Camboy), located just to the west. The singular historic event relating to this strait is its discovery by Willem Cornelisz Schouten and Jacob le Maire in 1616. Between 1615 and 1617 Schouten and Le Maire circumnavigated the globe in a search not only for elusive and apocryphal Terra Australis, but also for an alternative route to the Spice Island that would enable them to undermine the trade monopoly of the Dutch east India Company (VOC). In 1616 Schouten rounded Cape Horn, which he names for his birthplace Hoorn, and coasted New Ireland and New Guinea, in the process identifying several new islands which he named Willem Schoute eylandt (Schouten Islands). On the present example these are identified just to the north of New Guinea – a significant and telling point of variance between this and the 1609 Blaeu wall map of Asia. Here is a Map of Molucca Isles and Button, as I Jean Cornelisz de Moye describe with all possible exactitude, during various voyages I have made to the Button Strait. [our own translation]. Thusly we may ascribe, with some confidence, the primary map to Blaeu, the inset in the upper right to Schouten, and the engraving to the Blaeu firm for inclusion in Blaeu's 1619 publication of Schouten's journals. All and all a wonderful, fascinating, and appealing decorative map of the east Indies that will not likely appear on the market again. Willem Cornelisz Schouten (c. 1567 - 1625) was a Dutch navigator and explorer active in the early 17th century. Schouten was born in Hoorn, Holland. In 1615 Willem Cornelisz Schouten and Jacob le Maire sailed from Texel in the Netherlands, in command of an expedition sponsored by Isaac Le Maire and his Australische Compagnie in equal shares with Schouten. A main purpose of the voyage was to search for the apocryphal southern continent of Terra Australis. A further objective was to evade the trade restrictions of the Dutch East India Company (VOC) by discovering a new route to the Moluccas or Spice Islands. In 1616 Schouten rounded Cape Horn, which he named for his birthplace, the Dutch city of Hoorn. He followed the north coasts of New Ireland and New Guinea and visited adjacent islands, naming some the Schouten Islands. Although Schouten did in fact discover a new and previously unknown trade route, the ever jealous VOC claimed infringement of its monopoly of trade to the Spice Islands. Schouten was arrested (and later released) and his ship confiscated in Java. Jacob le Maire's wealthy father lobbied for their cause and Schouten was eventually freed. On his release he would sail to the Indies, this time for the VOC, where he fought several naval battles with other colonial powers over trade rights in the region. During one such battle was killed off the coast of Madagascar in 1625. Schouten's journals were published in 1618 and 1619 by Willem Jansz Blaeu. The Blaeu Family (fl. 1596 - 1672). The Amsterdam based Blaeu clan represents the single most important family in the history of cartography. The founder of the firm and patriarch of the family was Willem Janszoon Blaeu (Guillaume Blaeu, 1571 - October 18, 1638), a free thinking Dutch Reformist. He was born in Alkmaar. He studied astronomy, mathematics, and map making by the Danish polymath Tycho Brahe. Around 1596 he founded the Blaeu firm in Amsterdam to produce globes. It was in this initial period, from 1596 to 1672, under the leadership of the Willem Blaeu and with this assistance of his two talented sons Cornelius (1616-1648) and Johannes (aka Joan Blaeu, September 23, 1596 - December 21, 1673), that the firm was most active. Their greatest cartographic achievement was the publication of the magnificent multi-volume Atlas Major. To this day, the Atlas Major represents one of the finest moments in cartography. The vast scope, staggering attention to detail, historical importance, and unparalleled beauty of this great work redefined the field of cartography in ways that have endured well into to the modern era. The cartographic works of the Blaeu firm are the crowning glory of the Dutch Golden Age of Cartography. The firm shut down in 1672 when their offices were destroyed during the Great Amsterdam Fire. The fire also destroyed nearly all of Blaeu's original printing plates and records, an incomparable loss to the history of cartography. Shouten, J. C., Novi Freti, a parte meridionali freti Magellanici in Magnum Mare Australe Detectio. Diarium vel descriptio laboriosissimi et molestissimi itineris, facti a Guilielmo Cornelii Schoutenio annis 1615-17, (Amsterdam: Blaeu), c. 1619. Very good. Exhibits original fold lines. Some transference.